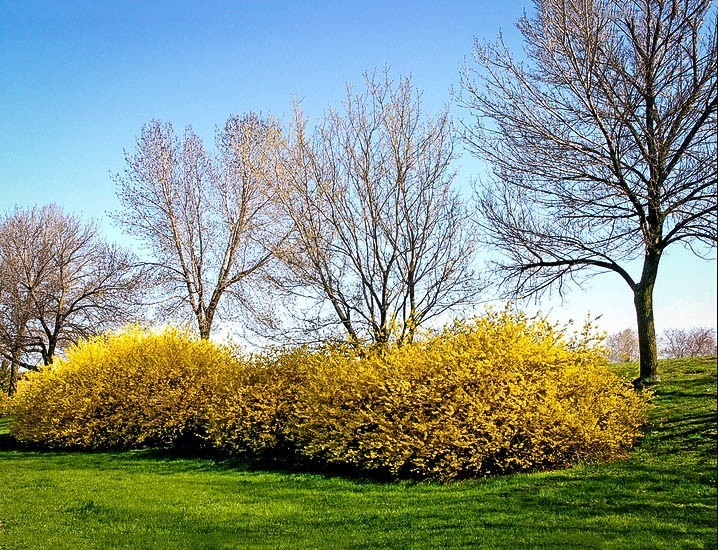 One of the very first shrubs to flower in late winter or early spring, the Lynwood Gold Forsythia bursts into glorious yellow bloom before any leaves are seen, and often while snow still lies in patches in the shade. This valuable plant is a medium-sized shrub growing to 6 to 9 feet tall and across. It is extremely tough, growing in clay soils, or any other soil and resisting harsh growing conditions such as are found in many cities. When planting a garden some shrubs are indispensable because they are both easy to grow and spectacular in flower – this plant is a definite must-have in every garden. 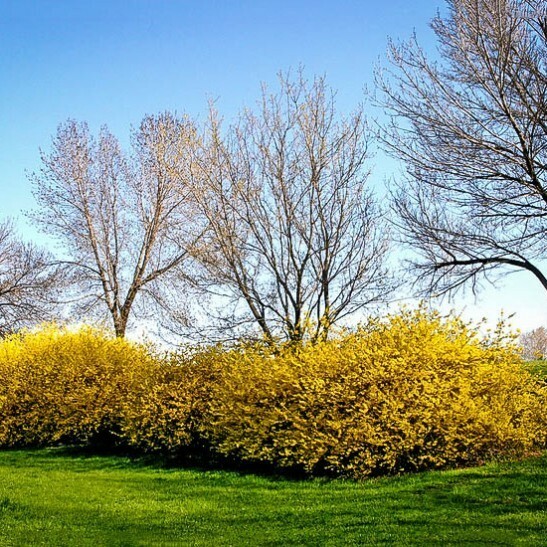 The Lynwood Gold Forsythia makes a beautiful addition to your garden and it also makes an excellent flowering hedge, forming a dense screen that is covered in bloom every spring, before becoming a rich-green barrier for complete privacy. For a beautiful forsythia that will flower perfectly in zone 5, see our Show Off Forsythia shrub. Winter can be a tedious experience and spring a long time coming – so a plant that will burst into glorious bloom at the first hint of spring, long before there is a single leaf on any tree, is something that should be in every garden. Forsythia is such a plant. The last snow will have hardly melted before Forsythia buds will be swelling and bursting into bloom, covering the bare twigs with glowing yellow blossoms that last for weeks. Forsythia is also a very easy plant to grow, thriving in almost any soil, resistant to dry summers, pests, diseases and needing very little care. Once blooming has finished for the year, your Forsythia will fill out with rich green leaves and become an attractive background plant for your summer flowering shrubs. 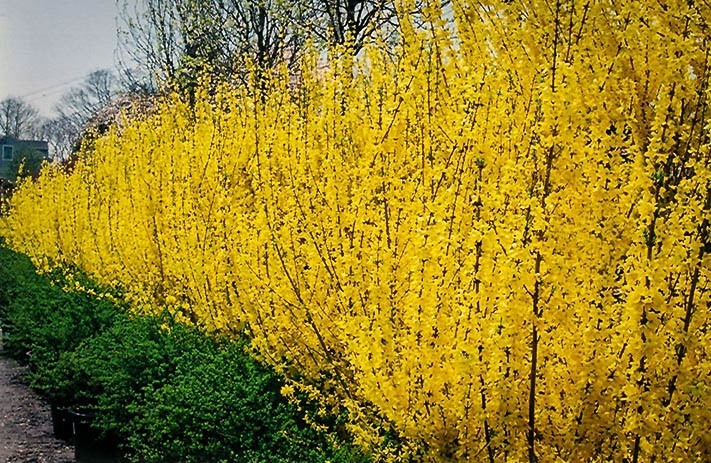 Not only is Forsythia tough and beautiful, it will grow 2 to 4 feet a year, so it quickly makes a hedge or fills in the background for your slower growing plants. It will grow in all types of soil, in city conditions and is free of pests and diseases. It is seldom badly damaged by deer, who may take a nibble or two, but Forsythia is so fast growing that the damage will not even be noticed. It will grow in heavy clay soils, and even live under Black Walnut trees, which kill so many other plants around them. 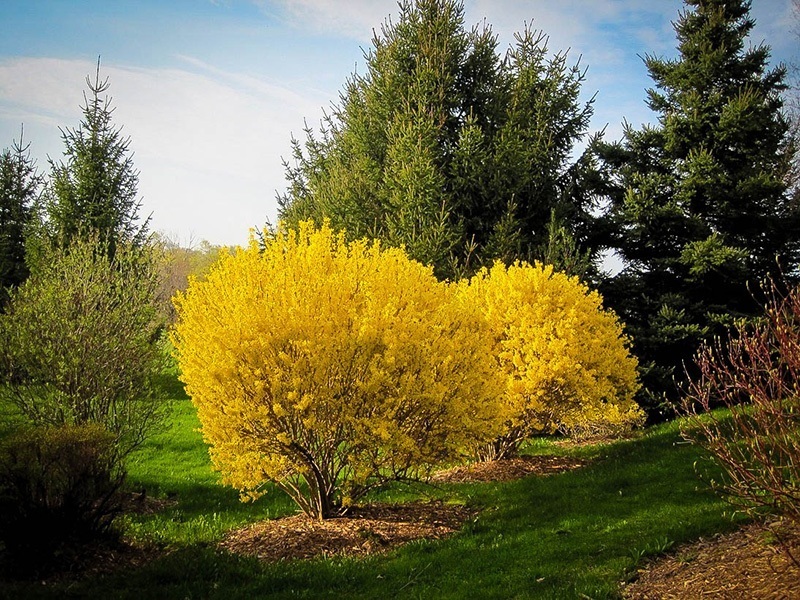 Forsythia grows into a rounded shrub with many branches, eventually reaching 6 to 9 feet tall and the same size across; so it is a great shrub for background planting where it will fill space and look terrific in bloom. The leaves are dark-green, smooth and about 3 inches long. The flowers are bright yellow with broad petals and are almost 2 inches long. They cover the bare branches in very early spring or late winter, as soon as the weather starts to become a little warmer and before almost anything else is blooming in your garden. Although Forsythia grows to around 9 feet in height, it can easily be kept shorter by clipping, so it makes a beautiful hedge. Unlike many plants turned into a hedge, which produce few flowers because of the regular clipping, Forsythia actually flowers even more if it is clipped and your hedge will be a blaze of yellow every spring. Forsythia grows easily in zones 5 to 8, so it can be grown right across America in all but the coldest and warmest areas. It needs some cold in winter to grow successfully. This is a very tough plant, which will grow in full sun or partial shade, in all kinds of soils and need no special care. It needs no water when established, except during extreme drought and will tolerate city conditions and urban pollution. 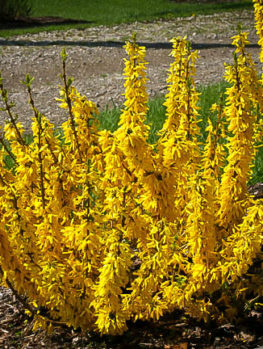 Forsythia is easy to grow and needs no special soil preparation. Just dig a hole or a trench twice the width of the pot. Place your plants in the hole or line them up in your trench, replace most of the soil and firm it well down. Then water thoroughly and replace the rest of the soil after the water drains away. For a hedge space the plants 5 feet apart, or as close as 3 feet if you plan on keeping your hedge short and narrow. Clip regularly as you would any hedge. Keep the top narrower than the bottom to be sure that leaves and flowers form right to the ground. If not grown as a hedge, prune a little after flowering by removing any very old branches, and trimming back others to keep the plant neat. During summer cut the ends off any very tall new shoots to keep your Forsythia full and compact. If it does get overgrown and too large, you can easily cut it back as much as you want, even right to the ground. Finally, if you tire of waiting for spring, go out and cut some branches from your Forsythia. Put them in a vase of water indoors and in a few days they will burst into bloom and bring some spring to your winter. 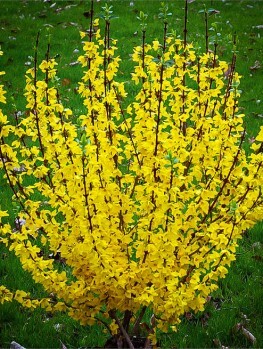 There are several kinds of Forsythia, but we are bringing you the best one for tough growth and a profusion of flowers. This is Forsythia x intermedia ‘Lynwood Gold’. This plant is a particular form of a plant that occurred naturally in a botanic garden in Germany when two species of Forsythia from different parts of China were growing near each other and produced a hybrid from natural seed. This plant was sent to the famous Arnold Arboretum near Boston, Massachusetts in 1889. ‘Lynwood Gold’ was found in Ireland in 1935 when part of one of these plants changed into a better form, with larger, richer flowers and stronger, hardier growth. It rapidly became a favorite with gardeners all over the world and now you can grow this wonderful plant in your garden. This Forsythia is a special plant and only the exact plant will have the flowers and toughness you need. So it must be produced directly from plants absolutely known to be right. Our shrubs are grown the correct way, from branch cuttings of these special plants. That way every tree is identical to the original so they will produce a very uniform effect, which is especially important when planted in a row. However, these take longer to produce, so avoid cheaper trees that will only be a disappointment. We sell only trees that are true to the original form and we have a wide range of sizes to give you the best plant for your purpose. We are constantly renewing our stock to ensure that our customers always receive fresh, healthy plants, so supplies of this tree may be limited. To avoid disappointment order now. Be sure to check out other varieties that we stock, like the Show Off Forsythia or the Golden Bells Forsythia.